Just thought I’d send you a couple of photos of what I had done with the Styrofoam on my kayak. Since then, I have mounted/bolted foam on the sides, about 6 inches up and about 7 inches wide. At first I had front mounted motor, so I mounted the foam in the “front” of my kayak, because I was a little uncomfortable with how deep the nose would go as I was launching. Sometimes I felt as if the water was going to rise over the bow and come into inner part, (but it never did). I used 1/4 inch plywood and two, 2×2 inch strips with 3/8 inch bolts thru and fastened thru holes on the top of my pontoons. I then drilled two more holes thru the center part of the plywood, between the pontoons, and bolted a length of foam to it. I shaped the foam, and it too is about 6 inches from the bottom of the surrounding pontoon bottoms. Next, I screwed a small section of 2×4 to the rear strip of 2×2, and made a mount for my trolling motor. From there, I took apart/removed the shaft and control unit from my trolling motor, and positioned the trolling motor mounting bracket on the 2×4 and fastened it in place. After ensuring it was centered, I drilled a hole thru the plywood that was big enough for the shaft to fit thru. I then pushed the shaft thru the hole from the bottom, and cut/gouged out a hole in the bottom of the foam that would allow me to put the motor/propeller into its recess. Once I had enough room for the motor/rudder to fit into the recess above the bottom of the pontoons, I soldered the wires back together, and reversed the handle on the control. I attached a fairly large battery to the back portion of the saddle, and connected everything. My first outing was out to the Chesapeake Bay! I launched from this place called the Mattapeake Fishing Pier. It is the first exit to the right, after you go across the Bay Bridge. There is a fairly calm/flat/shallow inner portion of water on the shore side of the pier, and I spent about 30 minutes getting comfortable with my new motor. It was at this time that I saw/met a new fellow kayaker. Anyway, fearless and confident, I launched out to the deeper, faster moving current of the bay, and continued out about 200-250 yards out from the pier. My buddy, with the “el cheapo” kayak went out with me for a while. I threw my line out, and almost immediately caught two fair sized croakers! I was in heaven! Even though it was rather windy, and the waves were getting a little high/rough, I was dry. My kayak seemed to have a harder time going left, than it did going right, but the long shaft on the trolling motor allowed my to position it deeper, and it was quite manageable. No speed records broken, but a steady “pull” (like front wheel drive in new snow), and I got to where I needed to go. I then noticed my new buddy had gone back in to the shallow portion, so I motored over to see why he went in. I went back in, and he said he was getting a little wet, and feared that he would get “swamped”. It was actually hard for me to believe such nonsense, since the only water I had in my kayak, was from when I reeled my fish in! Long story short – I convinced him to come with me about a mile or two, to the Bay Bridge, where we could get some BIG ONES!!! Reluctantly, he agreed, and I pulled him behind me with a nylon rope. About half-way there, he got swamped, and even though the W500 was still pulling his kayak behind me, (now in the direction of the shore), my new, strong swimming, PFD clad buddy, started panicking, and tried to climb into the back of my kayak. I was concentrating on moving towards the shore, and was at the front end of the saddle, before I knew what was happening, it happened – a ton of water rushed over my transom end, and my back half, and all of my stuff (rods, reels, net, bait, lures, tools, etc.) either floated on the surface (or mostly) sank like the Titanic! My front end, with the trolling motor still running, stayed about 2 1/2 to three feet out of the water. That foam was worth every penny! Now, while I tied my wrist around a rope I had fastened to the front my W500, to pull it out of water with, my new “buddy” decides to let my boat go, and swim towards shore to get some help! I had my PFD on, I can swim fairly good for a 58 year old (thanks USN), and I never thought that I was going to drown, but every 2 or 3 minutes, a great big wave would crash over my head. I never knew the bay water was so salty! I had retrieved my tackle box, and was holding it in my left hand, and holding the rope attached to my kayak with my right hand. Every now and then I would put out a blast with my signaling whistle, but no one seemed to hear. After about 30 or 40 minutes, I saw a 30 footer heading in my direction, so after thanking God again, I sort of relaxed, and waited until they got near. As they reached down to pull me in, I handed them my beloved tackle box. It by now had become quite water laden, but I was happy I could put it into some safe and dry hands. As I handed it to my rescuers, and they grabbed the handle, it broke, and the bottom part of my box went to the bottom of the bay…. Ok. I’m safe. I got pulled in safely, they lassoed a rope around the shaft of my trolling motor, and off we went back to the launching area. Once back at home, I immediately started sketching another model of a mount and foam section for the REAR of my kayak. Its purpose was to be twofold – I wanted it to make my “transom” unable to sink, and I wanted to make a mount that would be able to carry a heavy gasoline powered motor on the rear. I made both and had them installed about 8 days later. The place that my motor will sit is about 6 inches from the rear of the pontoons. Two weeks later, I spent a few days at our campsite, and my trolling motor’s controls had evidently become corroded from the earlier salt water dunking, so it quit on me about a half mile from where I had launched from. Once I paddled back in, I took it apart, and confirmed it had indeed become corroded and brittle, so I removed it and the battery completely, and paddled the last couple of days. I ordered some more foam when I got home, and after roughly shaping it to go alongside about 70% of the W, I bolted/attached it to the sides of the hulls. Two weeks later, I rigged my motor up so that it was all ON (full power), or OFF. I put the motor in the rear, and mounted the battery in the front, and with just a cheap on and off toggle switch I bought from a parts store, off I went to this place that is known for being the burial ground/water for many rusted and long abandoned Navy ships. A lot of folks catch big stripers and snakeheads in this area, but I was not so lucky. Everything seemed to work fairly well, so after church, the next day, off I went to Solomons Island, Md. I caught about 12 decent sized croakers, spots, and white perch for a while, but then all I started catching was some ugly toadfish! After about 6 hours out, I decided to come in, and I haven’t been back in yet. The wires weren’t the right gauges on my jerry-rigged trolling motor, so the switch burnt out, and the lighter gauged wires melted. I have picked up the right size/gauge wiring, and a new heavy duty switch, but I haven’t decided if I am going to mess with it again, or get another trolling motor. The trolling motor and battery, got me to where I wanted to go, so I figure that I will mount the new one up front with the battery this time, to balance my outboard out in the rear. The kayak did NOT go down more than an inch (if that much), with me and the motor sitting in the rear, so I’m going to push the envelope and try to use a 5 or 6 hp, 58-60 pound outboard motor (with an alternator on it), with a hydrofoil attached for good measure. If all goes (as I expect it), remote steering with lights will be next… I’ll keep you informed, and thanks again for creating such an incredible platform for me to work my dreams upon. A stern mounted motor works better for this boat than a bow mounted one. That was my own conclusion too after experimenting with both configurations. A 5 hp motor sounds like a little too much IMO, unless your new Styrofoam side mounted flotation is a game changer… I would try to mount this motor as close as possible to the cockpit, and not that far to the rear, even if it means getting rid of some of the foam you inserted between the hulls. These outboard motors handle better when they’re closer to the driver. Besides, mounting this outboard that far in the back could make the boat unstable. The foam between the hulls turns this twinhull kayak into a boat with a planing hull. It’s OK as long as you don’t paddle… However, at high speeds such as a powerful outboard can deliver the boat might lose its ‘grip’ in the water, and you could experience steering and control problems. Interesting! With such a heavy motor and going that fast you’d need as much flotation as you can get. One-shot, thank you for sharing your adventures and projects. What could be more fun than “messing about in boats” ? I would very much like to watch a video of this boat in action in Chesapeake bay..
That double capsize story was fun to read, but only because I knew it didn’t end in a tragedy. I’m sorry about all that fishing gear you lost. It’s not just a matter of money – one gets attached to their favorite gear, as we all know. Thanks for caring FW. I’ve thoroughly enjoyed your posts as well! Wow! Great concept! I was going to use a lowered front fairing from a motorcycle for my windshield, but this is more “hot-roddish” and classic. Thanks! The outboard needs to be located closer to the cockpit, for more convenience and better performance. Also, if you want the propeller to go up if it hits something (of course you want it), the part covering the rear hull tips would have to go. One more tip: Painting Styrofoam with latex paint seems to work pretty well, while using solvent based paint could damage the foam. One-shot, I was sorry to read about the accident you had with your kayak. That guy who climbed into it without you noticing it surely did a real disservice to you… and losing all that fishing gear that you had used for years must have been painful to you, I’m sure. The passage about the failed attempt to rescue your tackle box was epic, in a sad way… any angler would feel your pain, I’m sure. But hey, although you got wet at least you came out of this accident unscathed, and you even managed to recover your boat! I strongly agree about the need for side flotation in such a configuration – lots of it! 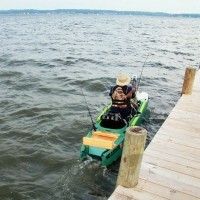 I also agree that outfitting this small kayak with more than one motor would be problematic, to say the least. As for the flotation under the saddle, it’s hard to tell. I guess it depends on whether One-Shot would be able add such floatation in a way that won’t create hydrodynamic problems at high speed, or any other problem such as with steering, or a stability problem when the kayak starts riding a wave that could form under the saddle. Berny Marsden demonstrated that propelling a W kayak of similar size with a 3.5 HP outboard was not a problem, but in this case the W500 is a bit smaller than Benny’s W boat, and the motor planned for being mounted on it is both heavier and more powerful than Benny’s outboard. Thanks “Iake” (sp?, can’t tell for sure what your name is…) for your response. I sincerely appreciate your honesty and your spirit in general. I know that what you and Yoav, and others have said genuinely follows sound principle and good judgment. My kayak is half frozen and covered with a tarp and about 3 or 4 inches of snow right now, but hopefully we will get a break in a couple of days (almost 50 degrees), and I can take a picture of how the foam is positioned on it now. But until then, imagine this. A piece of foam that is between 5 and 7 inches wide that starts flush with my registration stamp, runs all the way up to my (re-located) carrying straps, is flush with the top of the existing hull, and exactly 6 inches from the bottom of the pontoon. Each length of foam is supposed to be able to float 200 lbs. I deliberately kept the foam 6 inches from the bottom of the pontoons because I didn’t want to significantly alter (what I thought was) the 6 inch “draft” that I thought the W500 had. I figured that after I “fine-tuned” and balanced (filed and sanded) the foam, and then used epoxy resin ( and smoothed/polished them), I would have an almost perfect combination of almost 400 lbs. of extra floatation with relatively low friction. My “mad scientist” mind told me that with this, and the extra 100 to 125 lbs. of floatation foam that I have mounted in the front and rear, that my load carrying capacity might be increased to the point that an extra 100 pounds (motors and battery) or so might not hurt me too bad. I’ll be the first to admit, that while I AM a formally trained auto mechanic/electrician, I am NOT a formally trained engineer! LOL That is why I am so genuinely blessed to interact and learn from you guys! YOU guys are “hands down”, the experts here… Will my load carrying capacity go up or not? I cut my “hot rod” teeth when I was 12 years old, on a neighbors little car, ( a 1960 something Morris Minor), that a guy stuck a 429 big block Ford in! Lightweight frame + Big motor = Crazy SPEED! Fabrications, testing, reinforcements, a minor crash or two, and a lot of prayer, money, and hard work, yes, but the rewards were legendary. By the way, I don’t have ANY foam under the saddle area right now. I had told Yoav that I had some “pourable foam” that I was going to use, to bridge the “foamless” gap between the front and rear hull ends. I would then smooth and polish and slightly re-shape another “tunnel” on the underside, and angle the foam downwards as it went to the rear. I had also seen how another W500 owner had cut a segment of the saddle down (even with the reinforcing arches) to get a lower “center of gravity”. I wanted to do the same thing, up front, after I fabricated a remote steering mechanism. It would almost be like the early “jet boat” seating configurations. This coupled with a hydrofoil, the proper trim setting/angle, and a sensitive/mature throttle hand/foot, and I think that it might possibly work! Also, when I arrive at my general fishing location, I would just rise up out of my “lowered seat”, and slide back on the saddle, and get my fishin’ on! We tell people that they shouldn’t load their W500 with more than 360 lbs in total. This doesn’t mean it can’t be done, but it means the price for doing so isn’t worth paying, in our opinion. Typically, an overloaded kayak is also less stable, which is why outfitting yours with plenty of side floatation is so highly recommended. I would say it’s no less than critical. Thanks Yoav. My very FIRST outing, I was thoroughly baptized, due to overloading my W500. My best friend and fishing buddy from my military days of the 80’s decided to try that “tandem” thing, and get some fish to fry, like we used to 27+ years ago. Long story short – we collectively weighed about 420 pounds instead of the 360 or so that we USED to weigh back then… The creek couldn’t have been 4 feet deep, (as if the depth of the water mattered), so off we went… We were taking turns paddling, and trying to be careful, because we could SEE that the water was only about 2 or 3 inches from coming in. We made it about 3/4 of the way over and then….. KERSPLASH!!! I lost a couple of poles in the grass, seaweed, and lily pads, and we both destroyed our cell phones and wireless earpieces. A strange lady on the other side burst out laughing at us and could barely contain herself as she was telling somebody on her cell phone about how funny we looked! We just stood up and turned the W over to drain the water out, and more carefully, rowed back to the other side, changed our clothes, and went home. Our fiancé’s, after getting over their initial shock, have NOT stopped laughing at us to this day! 🙂 You’re right. We DO love being dry! As soon as I can, I’ll get you some video. I started out modifying my W500 with a highly efficient electric motor. I remounted the head in reverse and simply attached it to the motor mount that Wavewalk makes, yielding “front-wheel” drive. I knew I wanted this because my frame of reference was all the previous boats I owned. I always dreamt of 100% hands-free, self-guided propulsion. I assumed that paddling was the least desirable means of moving the boat. Experience changed my perspective. The trolling motor pushed the boat at the same speed as paddling. I still had to use my hand to steer and control the throttle. But now I had a motor that weighed 25(?) pounds and a battery at more than 50 (for all-day fishing). Perhaps the most significant “ah-hah” was when I found that the most natural thing to do with the paddle while casting was to put it, not across the gunnel, but across my lap! I really just had to drop it and it would be secure and behind my rod.. This meant no interference with fishing and instant access to “feather” the boat in any direction, with just one hand. Better control than a trolling motor. Of course, my fishing is different; freshwater for largemouth and smallmouth bass. Usually smaller lakes and ponds. Often very shallow and often very weedy. The motor shaft and prop did not work well in the last 2 conditions. But there are bigger lakes and reservoirs around here and I didn’t want to paddle for an hour and a half to get to a cove or return to the launch at the end of the day. So I added a 2hp 4/stroke Honda, but only when I went on bigger water. Total weight, less than 30 pounds. Maximum speed, 8 to 9 mph! Put a 1 gallon (yes, 1) gas can in the hull tip and suddenly I had a kayak that all at once was nimble, stable, light-weight incredibly easy to fish from and could easily cover 50 miles a day! I realize that much of this may not apply to your ocean-going needs. Just consider it may take a while before you “discover” the best solution for you. In the meantime, your modifications (and stories!) are some of the most amazing I’ve read! Thanks for your practical insight Michael, and I am honored that you would bless me with your wisdom. Experience has changed and (I believe), “driven” my perspective with what I want for my W500. My experience from merely “feeling” that water was going to come into the front of my boat (although it never did) when I launched, and then capsizing the first time (my fault), and getting dunked in the bay the second time (not my fault), drove me to install so much floatation foam all over my boat. But from a practical side, there are other benefits. For example, while out fishing by my campsite, I got some fishing line tangled up in my trolling motor. If I was going to have any chance of “motoring” back to my launching site, I was going to have to get in the water and cut and/or pull the line from around my propeller. No problem, the water wasn’t deeper than I was tall, so after cutting/pulling/cutting some more, I had to get back in. Normally, unless you’re as fit as a gymnast, it take a minute to crawl/jump back in these little boats. Another couple with a larger “Jon” boat pulled beside me, and when I pulled my self up on their side, their boat hardly dipped at all. Then to my surprise, when I pulled up on my side, once the foam made contact with the water, it felt as if there was a big log or boulder under me, because it didn’t “give” either! Very reassuring for me, since I don’t exactly have a lot of friends with kayaks or small boats to assist/rescue me! Thanks again for your words of wisdom. Styrofoam is easy to use, it’s durable, and it looks not too bad when painted, but it breaks easily. Humble beginnings Yoav, but as usual, incredible, even back then! I’ve read about using latex based paints as a “primer/protector” of sorts for foam surfaces. After I get my surfaces shaped correctly, I’ll be using an epoxy base to protect my foam. I haven’t decided if I’m going to just apply a few coats, and sand & paint, or strengthen/armor-plate with fiberglass sheet(s)/mat. Tomorrow is supposed to be warmer (close to 50 degrees! ), so I’m going to send in a few more pics. If I were in your place, I wouldn’t bother too much with sanding, priming, painting etc. before I’m absolutely sure that I got everything 100% right.